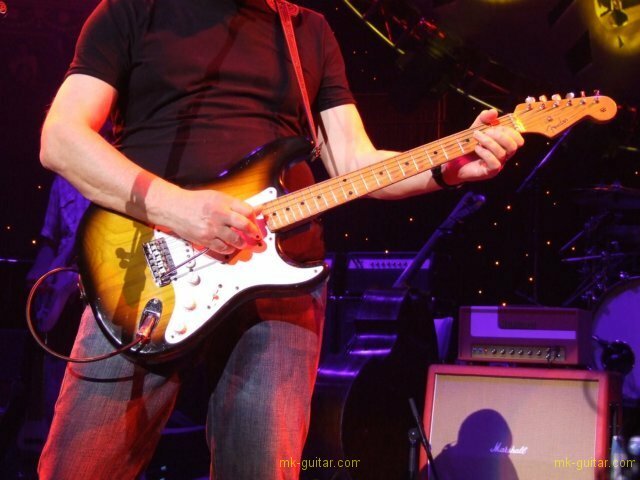 Info: This is an all-original Fender Stratocaster from the first year of its production, 1954. 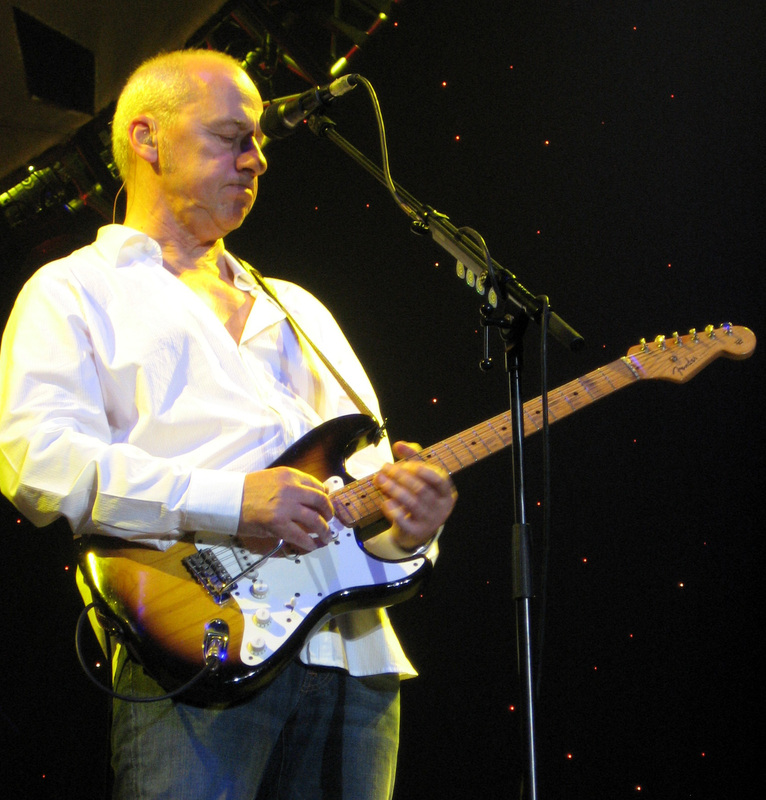 Mark got it from his friend Paul Kennerly, writer of Poor Boy Blues – the Grammy awarded first song of the Neck & Neck album by Mark Knopfler & Chet Atkins.The guitar made its recording debut on the Golden Heart album, but was possibly also used on Atlantis, Mark’s tribute to the Shadows which was also recorded in 1996. Mark calls it his “Jurassic Strat”. In fact Mark’s seems to regard it as his tool of choice to get the Hank Marvin (Shadows) sound, a guitar sound that has fascinated him since his childhood. 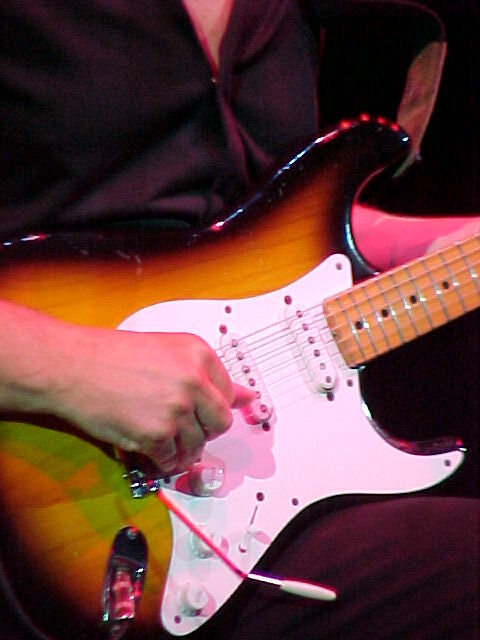 Just like Hank Marvin, he puts a set of heavy strings with a wound g-string (012) on this guitar, and also often [edited: “often” added, see comment #2] plays it with a pick instead of his trademark fingerpicking style. 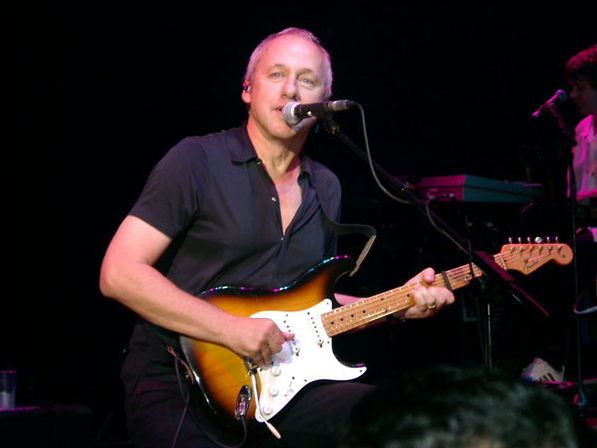 Likewise, he uses the tremolo in a similar way as Hand Marvin: no left hand vibrato, just tremolo from the Strat’s floating tremolo system. 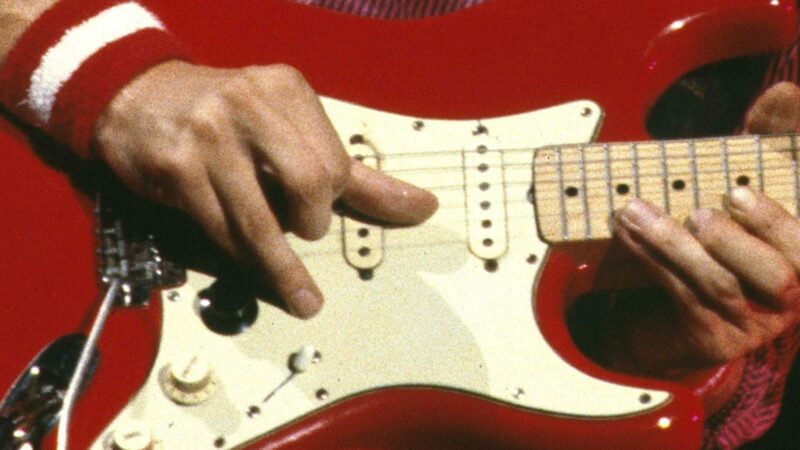 All Strats before 1957 had an ash body, so does this. The plastic parts were made of bakelite, a rather brittle material, the reason why often the pickup caps show significant wear (Fender changed to white plastic in 1957). Strats from this period are extremely sought after, and thus traded at a very high price. 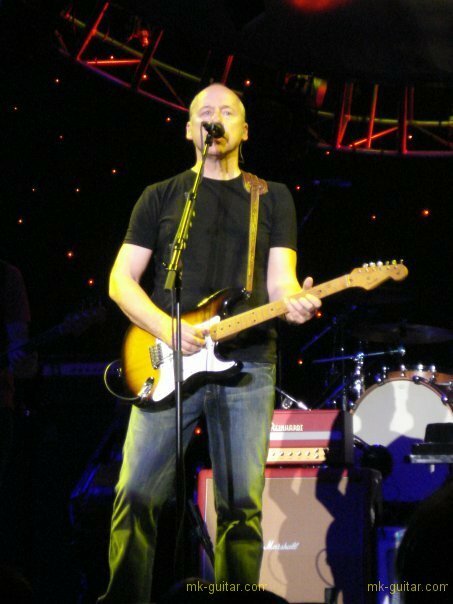 As Mark’s is in excellent condition, it will be somewhere between $ 50,000 – 100,000 (without considering that it is a Mark Knopfler guitar). 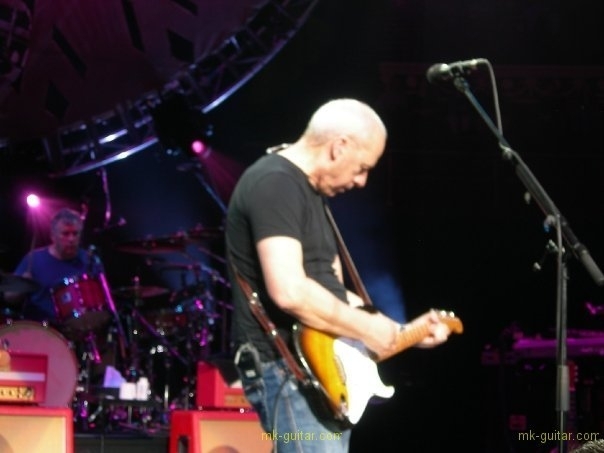 He still uses it on stage, normally for So far away (the album version was not recorded with this guitar of course) but sometimes he uses one of his Signature Strats (also with heavy strings) instead. 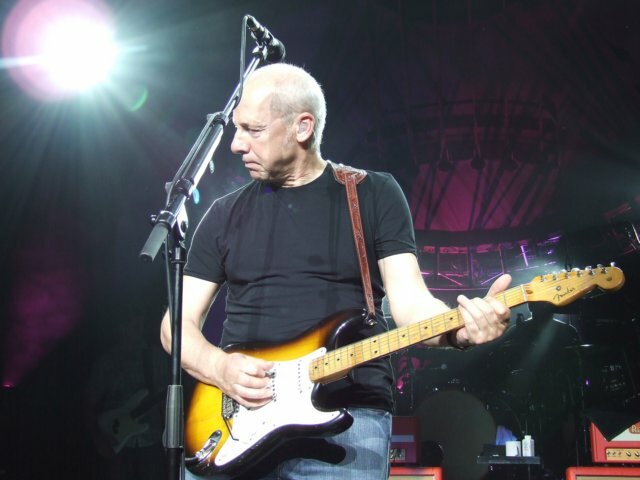 I did not want to say that he always uses a pick with this guitar but occasionally, I will edit the article to make it more clear.